How do you say "thank you" to all the Bat-fans who made your game such a success? Release a brand new character costume for free. Rocksteady has a lot to be thankful for, these days. Batman: Arkham City has seen strong sales (it dominated in October and has continued to sell well since then), received near-universal critical praise, and is already being heaped with numerous awards. As a result, the developer is saying "thank you" to everyone who's supported its latest endeavor and is giving out a free downloadable costume for the game across all platforms. Director Sefton Hill revealed that the studio is releasing the skin as a "thank you all for your incredible support before, during and after the game's release." 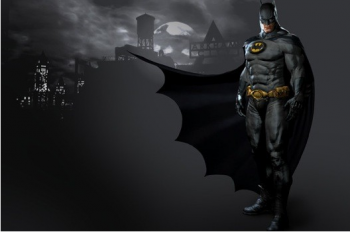 The skin is actually based on the outfits that appeared in Batman Inc. Additionally, Hill revealed a code that will allow players to use any downloaded skin in the game's campaign without having to beat the game first. The costume is going to be available for download on Xbox, PC, and PS3 tomorrow. Today, though, the latest DLC for Arkham City is launching, which contains Challenge Maps of the Batcave, Joker's Carvnival, and the Iceberg Lounge.